About Us Why Hero’s Companion? When Russian backed terrorist forces invaded Ukraine in the spring of 2014, the country found itself largely unprepared for war. What ensued was a largely crowd-funded war effort, together with large waves of volunteers signing up to fight in the Ukrainian armed forces and volunteer battalions. More often than not, in the early weeks and months of the war these soldiers – who range in age from 18 to mid-50s – were sent to the front to fight with what little protective gear and weaponry they were able to procure, usually with their own funds. To date, the war has already claimed the lives of over 9,115 people, including more than 2,500 Ukrainian soldiers. Throughout this conflict, Ukrainian forces have frequently been commended for their unrelenting spirit on the battlefield. 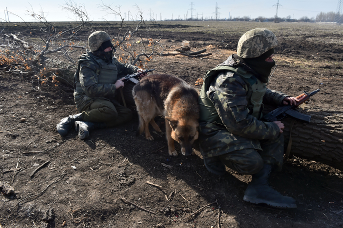 Despite having had little to no initial training – with much of the training happening in “on the spot” situations – Ukrainian armed forces continue to hold off an aggressor that is backed by one of the biggest military powers in the world. But as any veteran knows, physical battle is only one aspect of the challenges faced by soldiers. Mental training is equally as important not only for battle readiness, but also for life after war. Many of those who have fought or are currently fighting in eastern Ukraine had minimal psychological preparation, and this, combined with the extremely psychologically demanding nature of this war, has put them at a high risk for illnesses such as PTSD. Psychological trauma is already taking its toll on those returning from service. 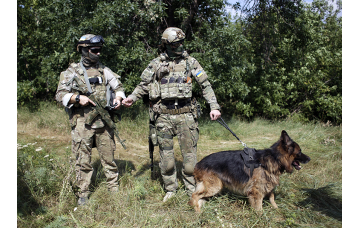 Since the Russian invasion begain in April 2014, over 250,000 soldiers have taken part in the Anti-Terrorist Operation (ATO). Over 110,000 have already been demobilized, a number that will steadily climb as times goes on. Of these 110,000 it is estimated that at least 30 percent suffer from psychological injuries as a result of time spent in combat operations, with 10 percent of all cases considered to be acute, according to Dr. Colonel Vsevolod Stebliuk, a former advisor to the Ukrainian Minister of Defence and the founder of a rehabilitation clinic at the Irpin Military Hospital. “The psychological effect of this war will be very strong and long,” said Stebliuk. Many soldiers returning home find it difficult to reintegrate back into civilian life. They are plagued by invisible scars left behind by their battlefield experiences, and often find it difficult to deal with the anxiety, depression, and aggression that manifest themselves as symptoms of PTSD and other brain injuries. Left untreated, these mental health issues can lead to economic marginalization, poverty, substance abuse, and violent behavior. They tremble and shift in their chairs, unable to sit still. They are constantly on guard. They get into fights. They don’t communicate openly. Their personal relationships fall apart. Memories of the combat trigger mood swings. Flashbacks of battlefield traumas are common. So are sleep problems and depression. Amputees reach to scratch their scabbing wounds with phantom limbs. Many experience night terrors. In a society that does not yet understand the potent nature of PTSD and in which a feared stigma is often associated with those seeking psychological and psychiatric help, it is not uncommon for veterans to turn to alcohol, drugs, and heavy medications in an attempt to silence the newfound demons in their minds. Hero’s Companion is a response to an urgent need to address these growing problems in a safe, healthy, and sustainable manner. The project grew out of a recognition of the distinct bond that could regularly be observed between soldiers and their animal companions on the front. 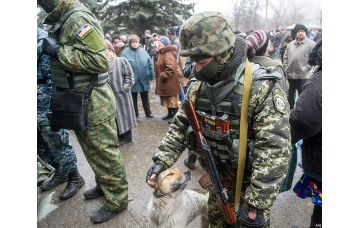 Story after story emerged about different Ukrainian battalions informally adopting stray dogs or cats. Numerous pictures, many of which are displayed throughout this website, can be found in which four-legged companions are never far from their soldier friends, providing companionship and even security. In fact, for over a century, canines have played important roles in military operations. Today they continue to be integral members of armies, police forces, and special operations units in Ukraine and throughout the world. A result of this intimate working relationship is the formation of a close bond between the servicemen and the dogs they work alongside. Service dogs for veterans – which are increasingly being used in North America and Great Britain – are an extension of traditional canine involvement in the military. In this new role, canines continue to function as “man’s best friend” but in a different setting, away from the frontlines of battle.